At the end of “Risky Bismuth,” we learned that The Terror was making Superian sick, and that it was due to his vulnerability to Big Bismuth. What we didn’t know, however, was exactly how he was doing this. 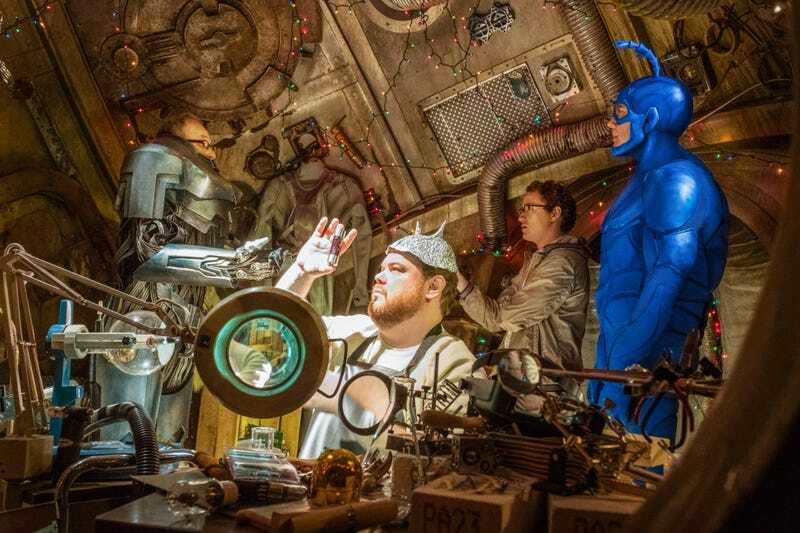 I had thought he had found some way to connect Superian to VLM (he seems to have a knack for convoluted efforts like that), but the actual reason is far more simple: The Tick is covered in Big Bismuth from when he destroyed Terror’s weapons factory. 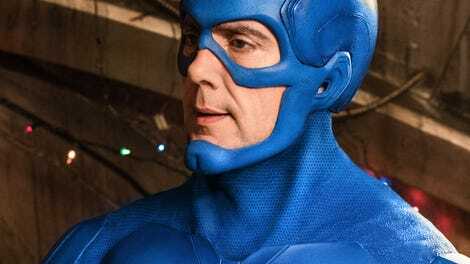 This means that Superian can’t be near The Tick, or else his condition will only worsen. This leads to an amusing scene where Tinfoil Kevin has to remove every single trace of Bismuth from the Tick’s body (“INSEAM! INSEAM! ), before setting us up to handle the more pressing matters at stake. As we learned of Karamazov’s inventions working with The Terror, the natural question was “but what about the suit?” We get our answer fairly early here; The Terror plans to have Arthur unknowingly set off a switch that will detonate the VLM, destroying the entire city as a result. After a handful of episodes that focused more on what a goofy, fun villain The Terror is, this episode firmly reminds us of just how much evil he’s capable of. After Arthur was traumatized by witnessing the death of the Flag Five, The Terror now wants Arthur to be responsible for a tragedy that will cause far more casualties. Clearly, the time for having fun with his character is over, and we’re left simply with the sociopath beyond the uproarious facade. Karamazov hatches a plan that would make it so flipping the switch only shrinks the VLM back to his normal size rather than destroying him, but he warns that there’s only a 20 percent chance that it will work. At this point, Arthur and Tick face the biggest crossroad so far: if The Tick detonates the switch, it will barely hurt him, whereas it will kill Arthur. However, the suit was designed for Arthur’s specifications, and Tick would have difficult time getting it on. In his finest moment yet, Arthur decides to but the suit on, and risk a four in five chance of death. I’ve mentioned this before in these reviews, but the most rewarding part of this show so far has easily been watching Arthur shed his cowardice, and as Tick often puts it, answer the call of Destiny. That said, Arthur’s thread is hardly the only source of drama here; it’s been established that Lint and Overkill were once in love, and in a surprisingly emotional scene, they explore their feelings for each other while she tortures him. They are by far the two most intense characters on the show, and it makes all the sense in the world that they would be attracted to each other. And yet, Lint being a villain and Overkill being a hero ultimately means they can never be together. A comparison to Romeo & Juliet could be drawn with the key exception being that in this case, they are driven apart by their own choices rather than circumstances they were born into. In any event, when Dot rescues him (by cleverly turning on the sprinklers so Lint couldn’t shock her without shocking herself) we can’t help but wonder if we’ve truly seen the last of these two, or what allegiances could be formed in the finale. As Arthur drives into the city to take on his fate, he receives a call from Walter. He remains his usual goofy, meandering self, but this time, they actually appear to connect. Walter calls Arthur “son,’ while he doesn’t respond with a “dad,” he nonetheless seems to appreciate it, and perhaps feels some regret about not giving him more of a chance. Of course, he experiences this right as he’s about to put himself in grave danger, and we can imagine that Arthur is now fully comprehending the weight of what he’s trying to pull. In an amusing meta-moment, Tick off-handedly comments about just how many stakes there are at once. In this case, we watch Arthur face regret over never giving Walter a chance, just as the fate of the city rests on his shoulders. When this show was announced, I had no doubt that the humor would be there, but the biggest concern was the storytelling. Could a show about a goofy superhero and his neurotic best friend/sidekick/whatever you want to call it really resonate? Those fears have proven to be entirely unfounded, as the show as done an excellent job of handling emotional moments in multiple episodes but especially in this one. Between Lint and Overkill’s tense reunion, and Arthur’s continued growth as a human being, we head into the season finale knowing exactly how much this matters for every one of our major characters. -When Dot rescues Overkill from Lint, she’s heard their entire conversations, and suggests they need therapy, and not just couples therapy. -”Science is not an exact science” is easily my favorite Karamazov quote of the year. Perhaps because I could totally imagine Trump saying it.